Pelin Yazar Cañez was born in 1969 in Istanbul, Turkey, where she studied at Marmara University, with painter Nevhiz Tanyeli, earning her bachelor's of Arts degree in Painting and Art Education; and at Istanbul Technical University, with photographer and artist Ahmet Keskin, earning her master's of Fine Arts degree in Painting, and Visual and Environmental Arts. She also studied under the late Turkish master Lütfü Cülcül. Pelin has developed a great deal of experience in the profession of art education, particularly with children. 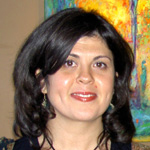 She has taught at institutions and workshops in Turkey and North America, and has exhibited there many times, including exhibitions at the Turkish American Association for Cultural Exchange (Chicago, 1999); the 20th Annual Festival of the Federation of Turkish American Associations (New York, 2001); the Middfest International Festival (Middletown, Ohio, 2000); and at the Fête culturelle familiale: Turquie (Rivière-du-Loup, Quebec, 2007). Pelin currently resides in Montréal, Canada. She is married and has three cats. My approach to painting derives from the consequences and possibilities of colours living side by side each other. I enjoy submerging in the surprise and play they offer as they are let loose from their tubes and containers, sometimes in pure splashes, sometimes mixed and worked, to take on new life on the canvas or board with imaginative flashes of brush or finger or knife. Everything depends on this relationship of colours; it is the primary joy of the visual art. Forms and patterns, contours and later delineations are conjured from their essential, vivid appearance and radiation. A harmony, or skilful balance, then becomes of the utmost concern. Without playing colours against each other wisely, or by ignoring a colour's own implicit array of sympathies and antipathies, the impact of colours moving emotionally across, into and through each other, is diminished. A painter in love with colour delights in the freedom of paint like a child, and succeeds through innocence; but, listening to colours, the painter deploys them according to their secret desires, and succeeds through the affectionate and intelligent care of the gardener. Ultimately, these colours grow to support a larger, a grander conversation of forms and patterns. I seek the emergence of bounded worlds that should glow with a simple, musical incandescence. I try to catch a glimpse of ecstatic magic through often benevolent commonplace objects, images, and animals set amid rough-hewn landscapes. This is where a person's heart resonates warmly, unburdened, but open to the dreaming rhythms that escape our more complicated and self-obsessed habits.